Basically there are two physical types of the windings. These are i) Single layer winding ii) Double layer winding. The sequential arrangement of coils around the armature is different for both these types of windings. In this type of winding, the complete slot is containing only one coil side of a coil. This type of winding is not normally used for machines having commutators. It is shown in the Fig. 1. In single layer windings permit the use of semienclosed and closed types of slots. Also the coils can be pushed through the slots from one end of the core and are connected during the process of windings at the other end. Here the insulation can be properly applied and consolidated which is advantageous in large output machines with high voltage. The single layer windings used in high voltage machines use small groups of concentrically placed coils. The interlinking between these coils is in such a way so as to minimize the space taken up outside the slot and in the overhang connections. It is shown in the Fig. 2. It consists of identical coils with one coilside of each coil in top half of the slot and the other coilside in bottom half of another slot which is nearly one pole pitch away. In the Fig. 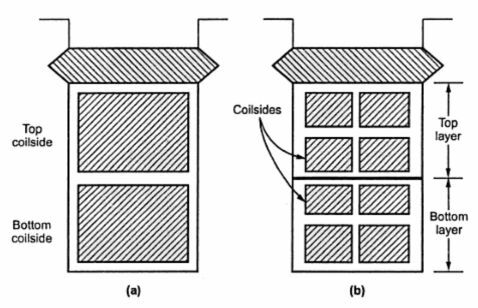 2(a) there are two coilsides per slot while in (b) there are eight coilsides per slot. Each layer may contain more than one coil side if large number of coils are required. For placing double layer windings, usually open slots are used. 1) It provides neat arrangement as all coils are identical. 2) Greater flexibility can be achieved with double layer winding as coil span can be easily selected.